In this Kitchen Nightmares episode, Chef Gordon Ramsay visits La Riviera, Inverness, Scotland, a fine dining restaurant owned by a multi millionaire Barry Larson and run by Head Chef Loic and a team of French chefs who have all worked in top restaurants. They are determined to get a Michelin star and have vegetables shipped in from France and very fresh seafood with high costs. Gordon discovers the problem is that the food is expensive, pretentious and no one knows what the food is. Gordon sits down to a meal to see what the chefs can do, he has canapés and a pre starter of rich Potato Soup, a scallop starter with far too many different flavours, a duck main course with 12 flavours on the plate and then a second half to the main, he finishes with a desert plate and is told how to eat it! He does not feel comfortable in the stuffy restaurant atmosphere. Gordon speaks to Loic after but he does not see any problem with the food and Barry lets Loic do what he wants. Gordon watches a dinner service from the kitchen and sees over complicated food. Loic turns down Gordon's offer to cook a scallop dish together to see different approaches. Gordon sits Loic down to a full table of food which turns out to be a meal for one and he still does not see any problem. His last resort is to bring in an ex AA inspector to inspect a scallop dish cooked by both Gordon and Loic. His feedback to Loic is to simplify the flavours, it finally sinks in and he simplifies his scallop dish. Gordon also simplifies the menu and gets the servers to loosen up. Barry reveals to Gordon he wants to revamp the restaurant at a cost of £35k whereas Gordon suggests a lower cost option of a Chefs table. 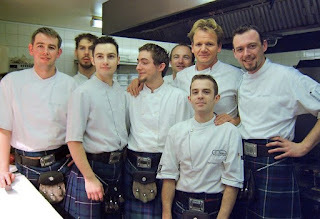 To lower food costs Gordon buys some cheap cuts of meat and challenges the chefs to cook a dish and gets the staff dressed up in kilts. Gordon invites local businesswomen to the restaurant for lunch and it was a big success with the simplified food and new restaurant. Gordon revisits, the restaurant has been renamed to Abstract and he has opened a new restaurant next door called Contrast. Business is not going well, they didn't get their Michelin star and the menu is complicated again with a Giblet Club Sandwich on the menu... Gordon discovers Contrast is fully booked and making lots of money and Abstract is not making any money. Barry and Loic announce they are opening another restaurant together in Edinburgh but the partnership did not happen. Barry opened Abstract in Edinburgh in March 2007, Trip Advisor reviews were good. Loic and Caroline moved to Edinburgh to work in the new Abstract but left in May 2007 and returned to France. In March 2009 they opened a restaurant L'atelier du peintre (The Artists Studio), it has excellent Trip Advisor reviews and in 2011 they were awarded a Michelin star. Contrast Brasserie is still open and is still located in the Glenmoriston Town House Hotel, the original location of La Riviera. The Edinburgh Abstract closed in December 2009, the closure was blamed on the recession. After Abstract Edinburgh closed it was bought by top chef Tom Kitchin and it was renamed as Castle Terrace and reviews look good with many awards, a Michelin star, 3 AA Rosettes and more. La Riviera aired on June 14 2005, the episode was filmed in 2004 and is Ramsay's Kitchen Nightmares UK season 2 episode 4. Wow. Loic is the Arrogant French Chef stereotype personified. The man can cook. Loic is just like any other person, people just cant change. Loïc is a very talented Chef and got a Michelin Star in 2011 for his restaurant in Colmar (F) "L'atelier du peintre" !